I hope you all had a wonderful Christmas and have managed to do some embroidery for Christmas this year. If not and most of us never manage to do everything we intend to do, make a note to do it next year! I use my iPhone to remind me of what I want to do next November and December or earlier, also creating a list of some improvements that need to be considered. Some of my customers have told me that they start as early as January, working on the embroidered gifts they intend to give! 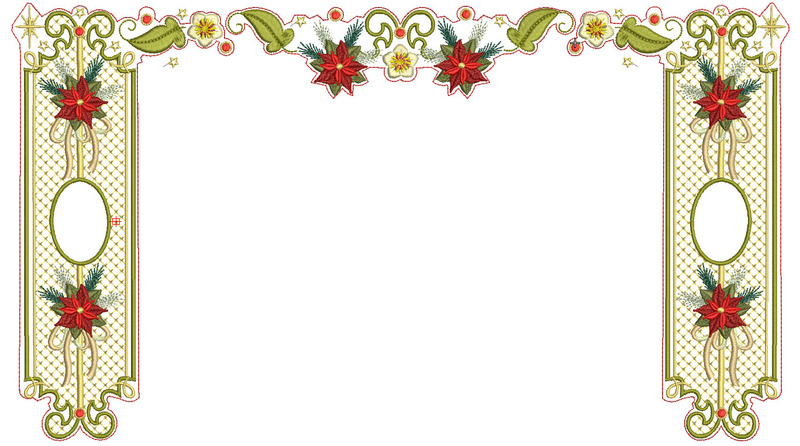 This is my seasonal back ground for my website. 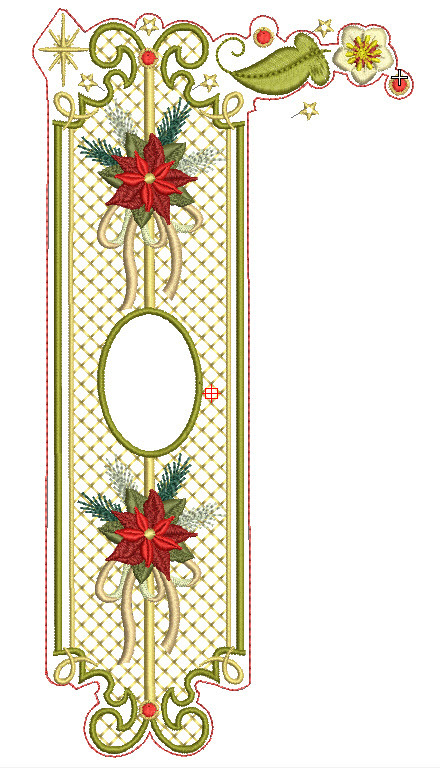 The two column designs each side are from Poinsettia Promises 3 which is due to be released on December 29th, 2014. 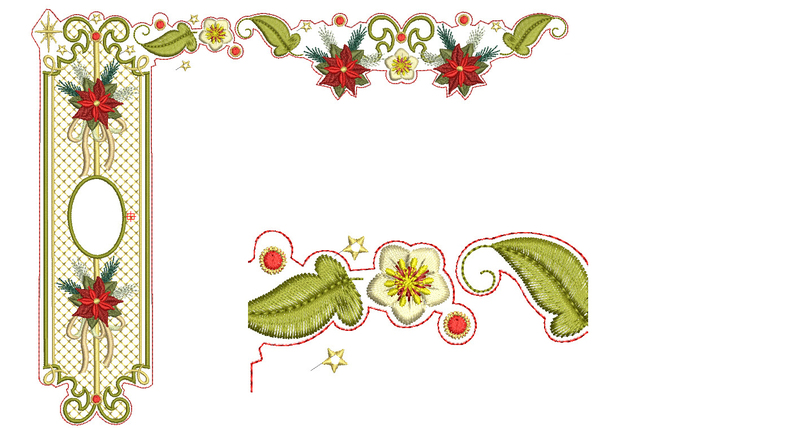 The central banner contains other elements from the collection but also some small designs from other collections, like ivy from Elegant Ivy, hellebores (Christmas roses) from Celtic Christmas and stars from Elegant Christmas Messages. I filled in a few gaps at the side so that the design flowed nicely across the webpage. This is a massive design impossible to stitch out in one hooping, and so I used my unique Outline alignment stitches (OAS) to help me align all 3 designs perfectly before having my website developer photograph it. Here is the left hand panel. 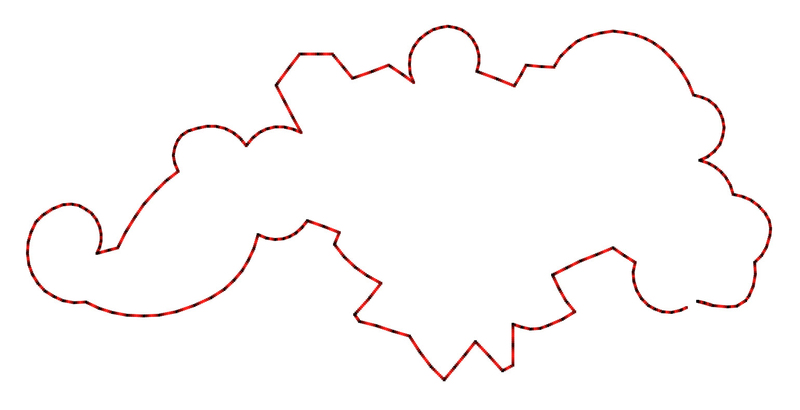 Notice that there are a series of red running stitches that surround the design giving an outline. All my designs come with and without this outline. What are there purpose though? Designs with OAS have “-S” at the end of the name. Place your stabiliser in your hoop, not your fabric. Then stitch out your first colour way which as you can see is an outline of running stitches. Your fabric will be attached with temporary adhesive, tacking or pins. 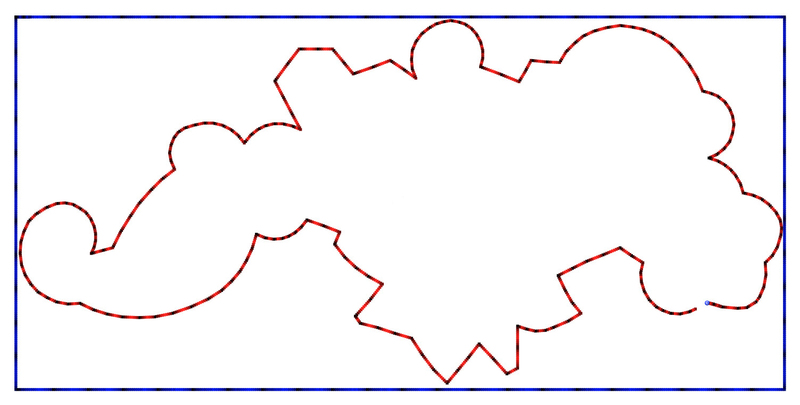 Placing it correctly will be so much easier using this outline. With most fabrics you will be able to see or feel the stitches beneath. I have added an outline of stitches to secure your fabric in position just in case your machine will not do it for you. After that providing the alignment is correct you can finish off your embroidery. However the real benefits of this system becomes evident when you have to position another design alongside it. For my stitch out I decided that I needed to stitch the central one first and then place the column designs each side of it. Notice the alignment shown in the insert. Here you see the perfect alignment of these three designs. TIP: remove as much stabiliser as possible between hoopings so that there is not too much build up which may also be hard to remove when the embroidery is finished. That is how the OAS work and although you may have other methods to align your designs many of my customers love this unique method which is exclusive to Graceful Embroidery. As promised visit the link below to download a special Christmas gift from me for being a subscriber of my blog. 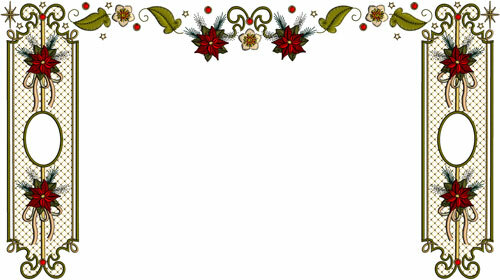 This entry was posted in Discussing machine embroidery and tagged Christmas, Outline alignment stitches. Bookmark the permalink. I published the article by mistake before I had finished creating the correct link. to download the gift designs. Thank you for the snowflakes, Hazel! They’re lovely. I love your OAS. It makes it so much easier to line up designs. Thank you for the gift and the information as well. Makes it much easier to plan to stitch a design!